Rajeev's World: 恭喜發財 - Kung Hei Fat Choy!!!! Today is the Chinese New Year, this year happens to be to be the Year of the Rabbit! My fascination for the Chinese New Year came about when I was in Hong Kong and Macau around the same time last year. The city had an exotic look. It was decked up, emblazoned in red to welcome the Year of the Tiger. It was nice to see red banners all over, little red lanterns suspended from the ceilings. 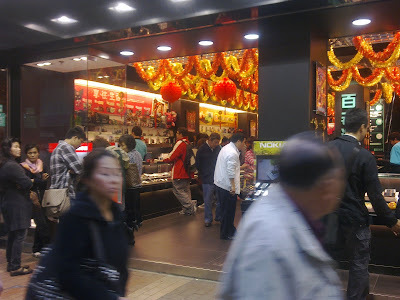 Shops carried messages, that appeared very exotic to me, saying: 恭喜發財 or Kung Hei Fat Choy!!!! And we were curious to know what it meant. We asked a hostess at The Spaghetti House what that meant, actually showed her a picture of the message: Kung Hei Fat Choy to make her understand. She said it was a greeting, may you be rich and prosperous. Long ago in the mountains, there lived a horrible demon creature named Nian, 年獸. On the first day of the year, Nian would awaken and come to the villages. He would eat all the grain and livestock. And if there were any kids stuck outside, they would disappear. The villagers lived in fear of this beast and locked up inside their homes on this night to protect their families. One year, right before this event was to occur, an old man visited the village. He turned to the villagers and asked, "Why do you fear this creature such? You are many and he is but one. Surely he could not swallow all of you." But the villagers remained skeptical and locked themselves up anyway. That night, Nian did not come. The old man had ridden him until dawn and the creature went back to its cave hungry. This went on for several nights until the old man revealed, "I cannot protect you forever." Soon the old man went away. The villagers were terrified that once the old man left, they would once again see Nian return. So the old man informed them, "The beast is easily scared. He does not like the color red. He fears loud noises and strange creatures. So tonight, spread red across the village. Hang red signs on every door. Make loud noises with drums, music, and fireworks. And to protect your children, give them face masks and lanterns to protect them." The villagers still took precautions, but there was one little kid, wearing a red cape, who scampered out. Nian on seeing the kid ran away, never to return back again. Today, the Chinese commemorate this day by having lion and dragon dances in the outdoors. Streets and sidewalks are decorated with flyers, dragons and lanterns. Restaurants have special menus for the festival. Offices are decked up. At home, the Chinese clean up, sweep away any ill-fortune in the hope of the incoming good fortune. Windows and doors are decorated with red colour lanterns and banners having couplets on "happiness", "wealth", and "longevity". On the eve of the Chinese New Year, supper is a feast with family and friends - the feast includes pork, duck, chicken and sweet delicacies. Families end the day with firecrackers. Kids are ones who have a blast of it all, like the way they do on Diwali here! Early the next morning, children will greet their parents by wishing them a healthy and happy new year, and receive money in red paper envelopes. We were also given a packet of complimentary red envelopes in a shop in Hong Kong and this year we did use these at home, for gifting and greeting one and all with 恭喜發財 - Kung Hei Fat Choy!!!! Isn't that simply another way to have fun and wish loved ones? We also learnt that children in Hong Kong are used to saying: 恭喜發財, 利是逗來, 伍毫嫌少, 壹蚊唔愛 in Cantonese, which can be translated as, "Congratulations and be prosperous, now give me a red envelope, fifty cents is too little, don't want a dollar either." Isn't that quite funny? Isn't it so much like the way we celebrate Diwali in India? Isn't there too much in common between us and the Orient? Perhaps because, for centuries, Indian culture and mythology had been a source of great inspiration for East and South East Asia, the remnants of which are seen today! Look at the way the Chinese pray, it's so similar to the way we pray! This year is said to be the Year of The Rabbit, based on the Chinese zodiac - how the Chinese zodiac came into being is another interesting story! This year is supposed to one of peace and calm, just the way rabbits are! Also, it is likely to be an year of introspection, where we reflect on what's happened so far, while planning for the future, somewhat like burrowing deeper like the rabbit. This is also the time to watch out that we do not become too indulgent. The influence of the rabbit is said to spoil those who like too much comfort and thus impair their effectiveness and sense of duty. Wonder what the Year of The Rabbit brings in for our world with all the turmoil in the Arab world and at home, in India, the state of paralysis in the government. But there are some lighter moments in all this turmoil. The Wall Street Journal just reported that bunnies had been reared especially for gifting this new year and the kind of havoc these little created in the homes of those who received them as gifts! But for me, I am waiting go out on Saturday night to have an authentic Chinese meal at the Aromas of China close by. That would mean an intense round of lobbying with Neeti, who is steadfastly keeping a hawk's eye on my calorie intake. But a couple of red envelopes and 恭喜發財 - Kung Hei Fat Choy's could turn the game in my favour!!!! Till then, 恭喜發財 - Kung Hei Fat Choy to all!!!! May the Year of The Rabbit (兔) bring good fortune to the readers of Rajeev's World!!! !